Pagalo’s Pizzeria & Gelato Café originally opened as Pinocchio's Gourmet Pizza on September 18, 1996 by John R. Hoffman. Pinocchio’s opened as a specialty gourmet pizza restaurant. 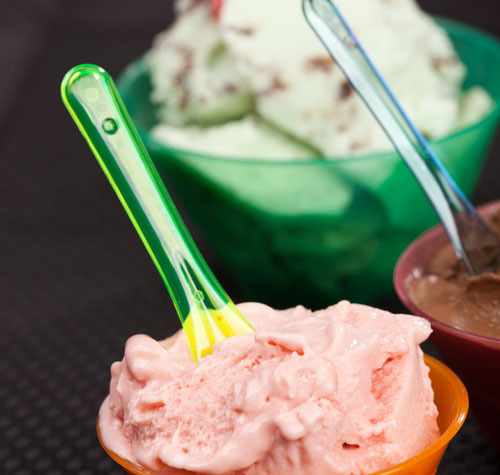 The name change to, Pagalo’s Pizzeria & Gelato Café officially took place on December 1, 2010. The reason for the name change came about with the desire to expand through franchising and a need to be able to trademark a name. A portion of our original name, Pinocchio’s had already been taken by another pizza restaurant in Texas and a search for a new name began. Since opening our doors for the first time on September 18th 1996 our intent has always been to provide our customers with a quality product and exceptional service in a pleasant atmosphere. Our original restaurant that consisted of what we call the main dining room had a seating capacity of 46 seats. In the summer of 1998 we began construction on a new room addition to handle the overflow and to help eliminate the wait time for a table. This also enabled us to handle larger groups of people for private & semi-private functions that we now call our banquet room. That room officially opened for business on August 17, 1998. With that addition we were now able to seat up to a total of 90 people in the restaurant with the completion of the banquet room, divided by 42 in the main dining room and 48 people in the banquet room. We lost a table in the main dining room for the new doorway into the banquet room. In January of 2001 we began the remodeling of the existing business that was located in front of us to open what was known as J. Crickets, you can still see some of the old signs that remain today behind the bar. J. Crickets was added as a full service bar and cigar lounge, a place where customers could smoke and still enjoy the same menu items that was offered from Pinocchio’s Gourmet Pizza. Now both the restaurant and the bar are smoke free since the smoking ban was enacted in January 1, 2008. The bar, J. Crickets officially opened on Monday May 21, 2001 providing our customers with more services and products such as a full liquor bar, cigar lounge, expanded beer and wine selections, game room, and later hours of operation. Today the entire establishment goes under the name of Pagalo’s Pizzeria & Gelato Café. In September of 1996 our menu consisted of primarily 15 gourmet pizzas, soups, salads, breadsticks, desserts, beer & wine. Today we have over 30 gourmet pizzas and expanded our menu to include hot & cold sandwiches, bread bowls, spaghetti night specials, expanded appetizers and of course gelato. We still continue to specialize in what has made us successful and famous, a destination location for our wood-fired pizzas. 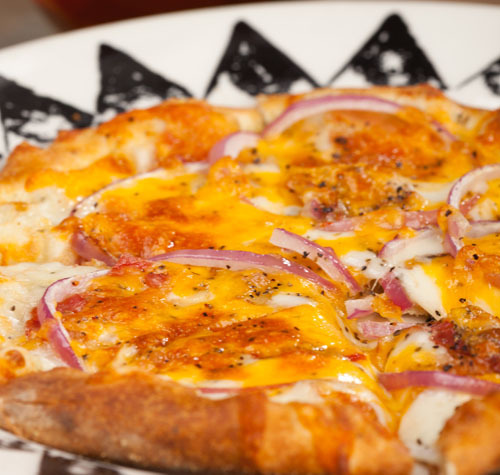 We continue the tradition of striving to make the best pizzas along with all items we serve to our customers. Since opening we have also been known for our fabulous breadsticks, exceptional salads, our homemade chicken salad sandwich and our wonderful soups like the Wisconsin Cheese. So no matter what you order from the menu, it is still the same exceptional quality that you would come to expect from Pagalo’s. We hope to expand to other locations throughout the Quad Cities area and beyond in the future with the continued support from our regular and future customers. 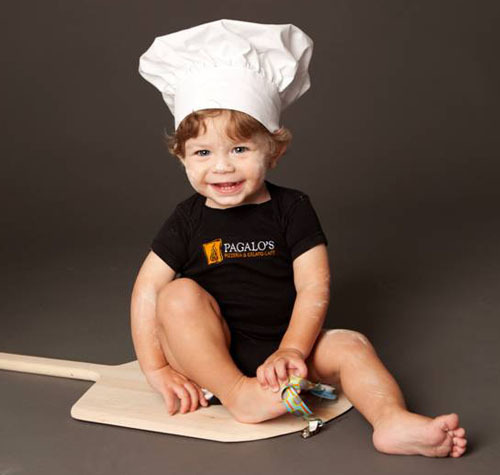 Oh, and if you have been wondering who the young pizza chef you see on our website is that’s our son Parker, who we were blessed with in October of 2011. Thank you for taking the time to visit our website and we hope you will be joining us soon for some of the Quad Cities best pizza and gelato!